Corfu and the Durrells – this island and this family have become inextricably linked in the eighty years since the family first arrived in on the island in 1935. Lawrence and Gerald Durrell both bought this magical Greek island to the world’s attention through their writing. In 1945, Prospero’s Cell was published and was Lawrence’s lyrical travel memoir of his time in Corfu. While Gerald Durrell’s vastly popular My Family and Other Animals was published in 1956, gifting the world with humorous and descriptive stories of his childhood exploring the fascinating natural world of Corfu. The fascination with the Durrell family has grown and grown as film Gerald’s popular stories have been adapted into films and TV dramas. Today a diverse, world-wide community of readers and viewers want to connect with Corfu and with the experiences of Lawrence, Gerald, Margo, Leslie and Louisa Durrell. So, what part does The White House in Kalami, a simple white building overlooking a pretty bay, play in the story of the Durrells and Corfu? The Durrells were a close-knit family but, unlike the family portrayed in My Family and Other Animals and ITV’s “The Durrells”, the family didn’t live all together in their time in Corfu. Twenty-three-year-old Lawrence was a married man with a young wife, Nancy. 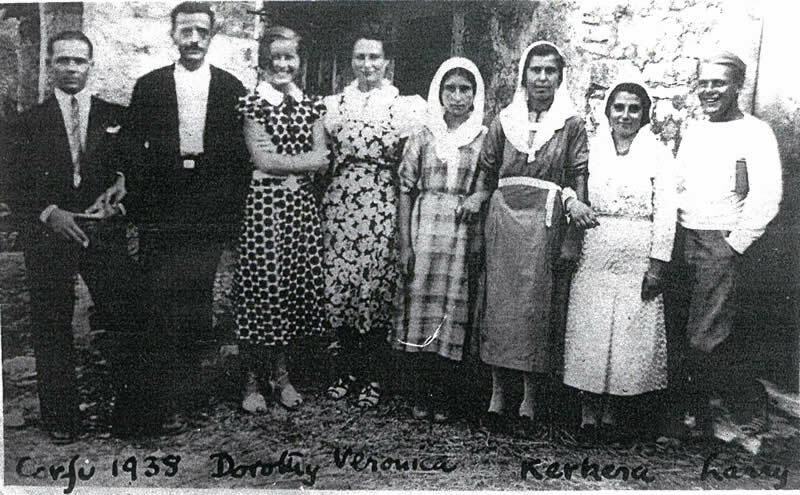 Though left out of Gerald’s Corfu writing, Nancy was very much part of the Durrell family and loved her time in Corfu as much the rest of the family. In Lawrence’s Prospero’s Cell, she is written as an enigmatic character, known simply as “N”. 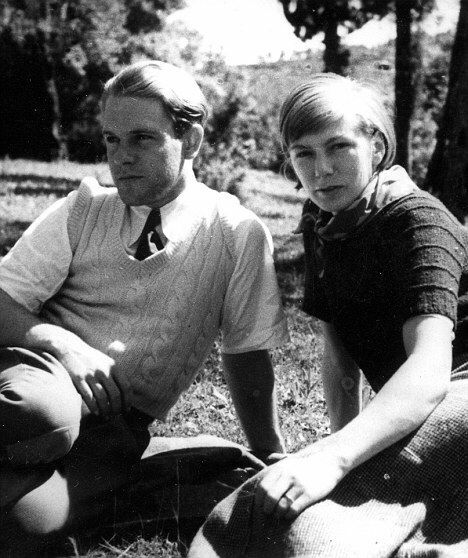 It was Lawrence Durrell who had the idea to move to Corfu with Nancy in the winter of 1935. He had been inspired by his friend, George Wilkinson who had sent letters describing the warm sunshine of Corfu. Increasingly frustrated with “Pudding Island” and “the English Death”, Lawrence longed for something different and Nancy, an artist, was happy with the idea of a more bohemian lifestyle on a Greek Island. 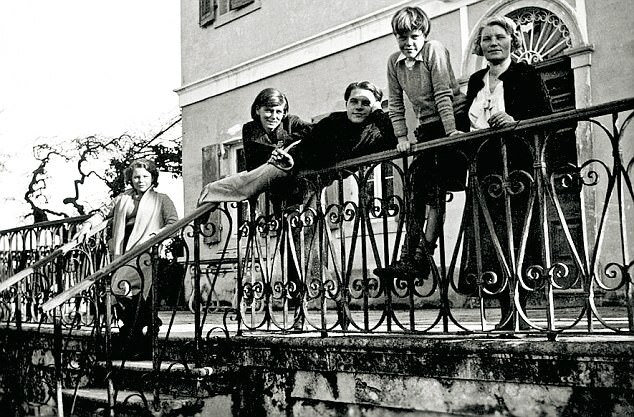 When Louisa Durrell, or “Mother Durrell” as the family called her, announced that the whole family would also like to move to Corfu, Lawrence was quick to distance them, but he didn’t exclude his wider family from his plans entirely. Lawrence and Nancy arranged to travel first to Corfu, with the rest of the family coming later. 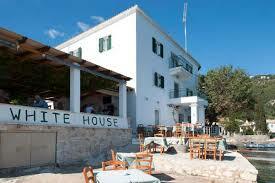 Once in Corfu, Lawrence and Nancy at first settled in a little villa in Perama that Lawrence called Villa Bumtrinket. When the rest of the family arrived, they set up home in The Strawberry Pink Villa close by, overlooking the iconic Mouse Island. After some time living in this area just south of Corfu Town, Lawrence and Nancy ventured further, to the North East corner of Corfu. They were both enchanted by the remote, rugged beauty of the area which was far more like the wildness they were seeking. In Prospero’s Cell, Lawrence quotes Nancy as saying, “the quietness alone makes it another country”. 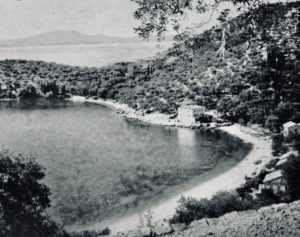 Spiros Americanos, their friend and driver, helped find rooms for them in in the North East of Corfu in the tiny hamlet of Kalami, set on a wide bay facing the Albanian mountains. Those rooms were in the building now known as The White House. At first, Lawrence and Nancy lived in two rooms in the house, along with the Atheneos family, the same family that own The White House to this day. Later Lawrence paid for an extra level to be built with windows facing the picturesque bay so he could write with a view out to the sea. In Amateurs In Eden by Joanna Hodgkin, she describes how her mother, Nancy, felt like she and Lawrence lived “the life of Riley” in those days spent in Kalami. They enjoyed swimming, reading, sailing in their boat the Van Norden, and soaking up the Ionian sun. They would walk or sail to the tiny chapel of St Arsenios which clings to the cliffs and swim in bathing spots with “two fathoms of clear water, and a floor of clean pebbles”. Lawrence was busy writing, in what was a very creative and productive time in his career; Nancy was enjoying creating her own paintings and drawings. In Prospero’s Cell, Lawrence writes of the room in the White House “where N’s pleasant, lazy paintings stare down from the walls”. For the young couple, these were the best years of their marriage; when they were at their closest. Lawrence wrote his novel The Black Book whilst living in the White House. 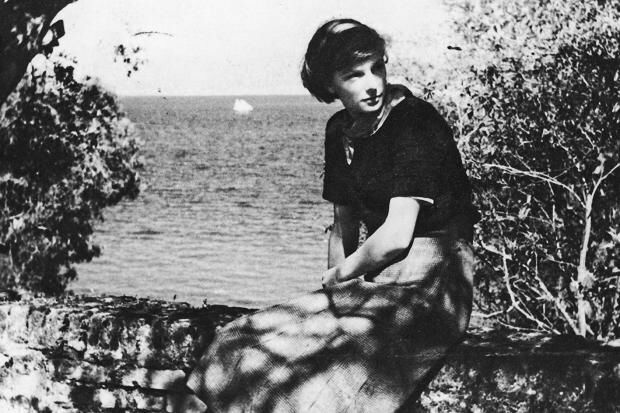 It includes this touching description of Nancy’s influence on him as a writer while in Corfu, “It is then that I get up in a panic and go to where you are sitting, working, and knitting and put my hands on your hands. Then in a moment or two my courage is restored…” This poignant, evocative scene was played out in the rooms looking out to the sea in their beloved White House. Sunbathing naked on the rocks in front of the house, entertaining family and friends, camping under the stars and living alongside the local community – The White House years left an indelible, lifelong impression on both Lawrence and Nancy. They came and went from the island during their four years on Corfu but returning to Kalami and the White House always filled them both with joy. Soon after leaving Corfu, Nancy and Lawrence had a child, Penelope, but their marriage did not endure and they separated in 1942, then later divorced. Today the White House has become an iconic part of the Durrell story. It is visited by hundreds of tourists and Durrell fans every year. Unlike other houses written about and lived in by Lawrence or Gerald Durrell, The White House is readily accessible to everyone. It has changed in purpose, as have many sea front houses in Corfu, by becoming a restaurant and guest house to cater to the visitors who come to share Corfu’s beauty, just as Lawrence and Nancy did. However, the White House’s true uniqueness is that it was the setting for Lawrence and Nancy’s own, distinctive love story. One set on a beautiful Greek island, in the sun and by the sea, starring two young, beautiful, and creative lovers in the heyday of their love affair – what could be more romantic than that?